During the 1960s heroic era of American space flight, going to space and writing about going to space were men’s games. Alongside the crewcut Glenns, Grishoms, and Armstrongs were an equally masculine cast of Mailers and Wolfes. 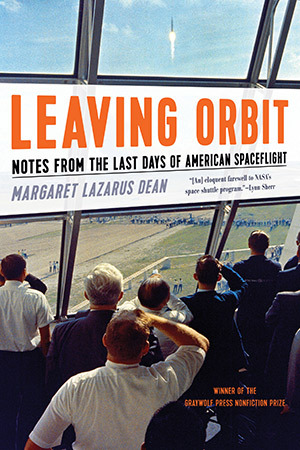 In her new book Leaving Orbit: Notes from the Last Days of American Spaceflight, Margaret Lazarus Dean engages with and subverts the masculine pedigree of American space. Still, Dean shows acute awareness of those who have come before her, offering running commentaries on Tom Woolfe’s The Right Stuff, Norman Mailer’s Of a Fire on the Moon, and Oriana Fallaci’s If the Sun Dies, the latest a book by a woman but still animated by the boozy, hetero-flirtatious world of 1960s Cape Canaveral. Dean herself outlines contrasts with all three authors, claiming they wrote of the beginning (or pinnacle) of the American manned spaceflight era, while her job is to chronicle the end. Dean writes of a nation apathetic to the fizzling out of its manned spaceflight program, while the other authors in question wrote of the heady, intoxicating days of its rise. Yet the chief contrast between Wolfe and Mailer (and to some extent Fallaci) and Dean is that Dean’s perspective is transparent, honest, and refreshingly devoid of machismo. Dean’s perspective on spaceflight shines especially when she details the logistical steps required to visit Cape Canaveral for each of the last three Space Shuttle launches—much discussion is given to coverage for her classes at University of Tennessee, as well as negotiating childcare arrangements with her husband. When Dean decides to go back to Cape Canaveral to see the final landing of the final shuttle (after managing to see the last three launches), she writes, “the look on [her husband] Chris’s face when I told him about the landing, about the towback and the party and the oddly cheap fare, could best be described as be-wearied.” Such candor and behind-the-curtain revelations are rarer to find in the high-flying prose of Wolfe’s or Mailer’s space books; in those, we are to expect that everything magically fell into place so these men could witness history. In Leaving Orbit, we see that witnessing history is no easy task. Omar and I have said many times that we both plan to be at the Discovery welcoming ceremony at Air and Space in DC, and I hope he is serious—partly because I’d like to see him, but also for the murkier motivation that I think it will be poignant to see him say his goodbyes with Discovery, and I want that scene for my book. From the onset, Dean’s purpose is clear—she wants to watch the last three Space Shuttle launches, and she wants to figure out what it means. While Tom Wolfe’s thesis in The Right Stuff is clear from the start, Dean’s book is shaped not by its thesis but by its author’s hunt for one. Sequence after sequence in Leaving Orbit features phones stuffed with voice memos, stacks of books, and an author putting herself in a place or conversation that might yield an answer to the question that animates the whole book: what does it mean that we were going to space, and now we’ve stopped? In many ways, the book never really answers its core question, but in avoiding a neat thesis (unlike, say, The Right Stuff) it’s a space book for our times: it is uncertain, transparent, questioning, and unsettled. One thing Dean refuses to say, though, is “it’s going to be okay.” Every time a former astronaut delivers a platitude about the American exploratory spirit, or some shell of a NASA program bound for congressional putting-out-of-its-misery, Dean refuses to be optimistic. She writes, “Everything is not fine. We have no space vehicle anymore. Like my students, the public needs to know that American spaceflight stopped, and to feel sad about that, before they will clamor to rebuild it.” Margaret Lazarus Dean’s fascinating book never shies away from grand statements—when a student asks her why we’re not going back to space, she writes that it’s “a question that depends on what you believe about big concepts like Human Nature and American Spirit.” However, Leaving Orbit is still remarkably inquisitive and self-effacing. It introduces a savvy, angry, and questioning voice to the chorus of writers who have set their sights on the American manned spaceflight project. That alone is reason to mourn its end. Danny Caine‘s poetry has appeared in Mid-American Review, Hobart, Atticus Review, and New Ohio Review, among other places. He hails from Cleveland and lives in Lawrence, KS where works at The Raven bookstore and serves as managing editor of Beecher’s.